Leeds Festival is one of the UK’s biggest and best music festivals taking place over August Bank Holiday Weekend. This year’s top acts scheduled to perform include Foo Fighters, The 1975, Post Malone, Twenty One Pilots and many more. Let us help take the stress out of travelling to and from the festival with one of our Sail & Coach packages. Sail over to either Heysham (Wednesday) or Liverpool (Thursday) with all your camping gear. 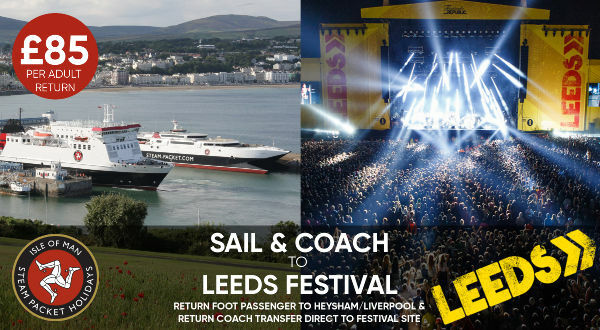 At the port a coach will be waiting to collect you and take you directly to the Leeds Festival site. After the festival has finished you’ll be collected and taken back to Liverpool port on Monday evening to sail home, all for just £85 per adult / £70 per child return (under 16s)*. You must have a weekend festival ticket plus an 'Early Entry' ticket to gain access to the site on Wednesday. Early Entry tickets can be purchased here. *Trip includes return ferry travel as a foot passenger and coach transfers, weekend festival entry tickets are sold separately here. Children under 16 must be accompanied by an adult 18 years or older. Passengers will be limited to one camping bag and tent per person. A full itinerary will be provided to passengers 10 days prior to travel.